Dell EMC enables organizations to modernize, automate and transform their data center using converged infrastructure, servers, storage and data protection technologies. This creates a trusted foundation for business to transform IT through a hybrid cloud, cloud-native applications and big data solutions. Discover a vision for the future to innovate faster and change the game for your business. 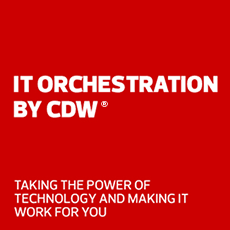 Connect with CDW at the Dell Technologies/World Conference in Las Vegas, April 29 - May 2. Dell EMC is equipped to help any business achieve immediate success with one of the broadest all-flash portfolios in the world. PowerMax changes the game for data storage by delivering performance through a combination of powerful architecture, simple operation and trusted innovation. Dell EMC has the portfolio, expertise and market-proven offerings to address your all-flash requirements and transform your infrastructure. Learn how Dell EMC has put Rio Grande Pacific at the forefront of short-line railroad holding companies and commuter rails. Simplify your digital transformation and modernize your data center with hyperconverged platforms from a leading converged infrastructure portfolio. VxRail™ dramatically simplifies IT operations while lowering your overall capital and operational costs. Dell EMC VxRail Appliance delivers a secure infrastructure resilient from the ground up that protects the platform through the stack of hypervisor, VMs, OS and applications. Modernize your data center with the one of the industry's most comprehensive converged infrastructure portfolio. Take your technology and your business to the next level and keep it simple along the way. With built-in automation and up to twelve times better database performance, PowerEdge servers are designed to optimize your most important applications. Maximize performance across the widest range of applications with highly scalable architectures and flexible internal storage. Automate the entire server lifecycle from deployment to retirement with embedded intelligence that dramatically increases your productivity. Dell EMC PowerEdge servers automate and modernize your infrastructure to improve workload performance, reduce costs and free your staff for higher business priorities. Get the details on the new PowerEdge MX, a modular, modern platform built for the software-defined data center. Protect all your data—any workload, wherever it resides—with guaranteed satisfaction and future-proof protection. Converged, integrated data protection appliance, tailor-made for mid-size organizations. Get powerful data protection for midsize organizations and remote and branch offices of larger enterprises. IDPA DP4400 is a converged appliance that combines backup, replication, deduplication, search and analytics as well as long-term retention to the cloud. By 2025 IDC predicts global data will grow ten times from 2016 levels. As companies rely more on data availability and accuracy, data protection has become critical to IT transformation success. Dell EMC's future-ready networking solutions help you improve network performance, lower networking costs and remain flexible to adopting new innovations. Healthcare organizations need to develop a modern infrastructure strategy that allows for deploying private and public clouds to store, manage and protect data. The first modular server designed with kinetic infrastructure, PowerEdge MX delivers next-gen network performance and bandwidth. Accelerate your enterprise technology adoption with expert deployment services. See how Dell EMC storage offers unbeatable value with a modern, feature rich product portfolio. Ready to Optimize Your Data Center with a Dell EMC Solution?